The previous weekend had been tiring and really testing my limit. Got workshop on both days from 9am to 5pm but I did not manage to attend the Sunday workshop which is the merrier one due to an inevitable circumstance. So... let me start off with my Saturday. At that Saturday, I had to waste my sleep time and woke like my usual study time at 7am so that I could be at UM by 9am. Got myself prepared and got there quick. Never expected the traffic to be so smooth, got there in approx. 20 minutes. The day started with the same thing as the last leadership workshop, some lessons and nice teaching about the type of leadership, the qualities and the abilities of one. Got ourselves separated into groups and mixed up. It was funny how all of them push the leadership position to me. Obviously I rejected the proposal because the workshop belongs to them, they should grab this opportunity to learn everything they can. To me, being a leader is a great chance to learn a whole lot things at a different level where you can never learn usually. But still me, Pei Ling and Soo Mei tried our best to guide them through and through. Oh... by the way, they appointed me as the cheerleader, I guessed that's what you get when you be too loud. After the Saturday workshop, I chatted a little with the 3W bunch and I got myself prepared for my futsal session later that day (7pm-9pm). That day wasn't a particularly pleasant game as I was so disappointed with the play shown by my team mates. Being selfish and not thinking for the better of the team. I was so frustrated that I started shooting whenever I got the ball wherever on the court. After the game, got ourselves to Steven's Corner to grab my dinner. Ordered Nasi Goreng Biasa topped with Sup Kambing. The Sup Kambing was spicy but delicious. After the drink + eat session, watch some football and then went home to prepare for the next day. Unfortunately on Sunday, I woke with a bad tummy ache. I think I'll thank Sup Kambing for the unbearable tummy ache. Couldn't even get myself some time away from my bed or the toilet bowl. Took some pills to decrease the pain and went back to bed for rest. Until at about 11am, I was awoken by my mother, she told me that some of my friends (Lum, Han Jim and Yu Kiat) were already here to pick me up for a friend's (Lai's) convocation. 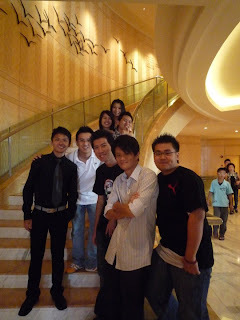 Get myself dressed and went with them to One World Hotel. For about an hour photo session. After that session, we went to Piccadilly for lunch. I ordered Mushroom Bruschetta and Hot Chocolate, the bruschetta was nice. After the lunch, just went home and continue my rest. Totally skipping the Sunday session of the workshop. Though I skipped the workshop on Sunday, my whole body was tired from what I've been taking for Saturday and Sunday. Now, I'll need to refrain myself from eating spicy stuffs for awhile until I got my stomach back to it's working condition. Pray for my fast recovery.